Depending on what sources you read, you will get different opinions. Roman Catholic sources will tell you that Tanucci was an anti-clerical zealot responsible for establishing the supremacy of the state over the church in southern Italy in the mid-1700s. Precisely for that reason, say others, he helped bring enlightened government to the Kingdom of Naples right on the heels of the French Enlightenment —a perfect time for it. Your call. Tanucci was born in Arezzo in Tuscany and educated in Pisa where he became a law professor. At the beginning of the Bourbon rule of the kingdom of Naples in the 1730s, he found his way into the service of the first monarch, Charles III. 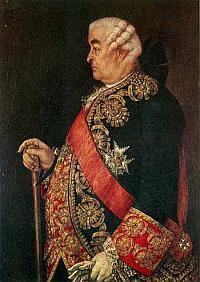 Tanucci became first councilor of state, minister of justice, foreign minister, and then in the 1750s, prime minister. He provided skilled and shrewd council to the king, who truly valued Tanucci’s service. He was especially valuable when Charles abdicated in 1759 to return to Spain, leaving the throne to his nine-year-old son, Ferdinand, a numskull kid who matured into an oaf and who would eventually rule until well after the Napoleonic wars (!) having established himself as the Re lazzarone (roughly, “Beggar King”) one of the least capable European monarchs in history. Tanucci was the regent, providing valuable service to the child king as he had to the father. Tanucci was so good at what he did that Ferdinand—even after he reached majority and was allowed to make his own decisions—left government pretty much in the hands of Tanucci, who remained in constant contact with Charles back in Spain. Tanucci was the mainstay in the kingdom of Naples of the Enlightenment commitment in much of Europe to diminish the power of the Church. The balance of power between Church and State in Europe lasted more than one-thousand years (from the establishment of the Papal States in 756 to their demise in 1871) and is beyond the scope of this entry; suffice it to say that by 1760, the power of the church was in severe decline. In Naples, Tanucci was zealous in abolishing the feudal privileges of the Church and restricting its legal jurisdiction and prerogatives. He closed convents and monasteries, reduced the taxes to be forwarded to the pontifical Curia, and was pivotal in the expulsion of the Jesuits from the kingdom in 1767, an episode that resulted in his being ex-communicated (at which point, he closed two more monasteries). He was also responsible for reforming the legal code of the kingdom by setting up a commission of jurists (whom, today, we would call “a bunch of lawyers”, but in the mid-1700s it was a progressive move). It was an age of “benevolent absolutism” and Tanucci help shape Naples in that mold and break the mold of the kingdom as a fief of the Holy See. It was under Tanucci’s guidance that the local version of the Enlightenment flourished, people such as Gaetano Filangieri and Antonio Genovesi. In 1774, Queen Caroline joined the Council of State (as her marriage contract specified she might do as soon as she bore an heir to the throne). Tanucci, then 76 years of age, was no match for the energetic and ambitious Caroline. He retired in 1777 and died in Naples in 1793. His enemies claim Tanucci and people like him paved the way for revolutions. That's what his friends say, too.